India's number one tourist draw is not the sun-bleached beaches of Goa, the palaces of Rajasthan or even the postcard-perfect Taj Mahal. 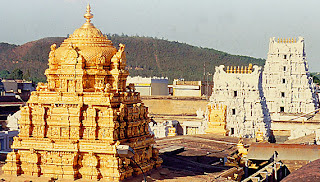 It is the country’s richest shrine — the Sri Venkateswara Temple at Tirupati in Andhra Pradesh. With the largest number of tourists headed for Tirupati, Andhra Pradesh tops the list of states in generating tourism revenue, says the latest “Incredible India” report of the Ministry of Tourism. Thanks to the Taj, Uttar Pradesh comes a close second. The report says Andhra Pradesh garnered 24.5 per cent of domestic and foreign tourist visits in 2005. UP and Tamil Nadu followed with 24.3 per cent and 11.3 per cent respectively. Karnataka (6.5 per cent), Rajasthan (4.9), Uttaranchal (3.7) and Maharashtra (3.7) followed. But the ministry declined to reveal the actual number of tourists. “We get many queries about Tirupati from foreigners as well as non-resident Indians,” said Jyoti Mayal, director of travel agency New Airways. In the late 1960s and ’70s, backpacking foreigners smoked hash and blazed a hippie trail through spiritual India. Spiritualism, it seems, still gives a high. Most of the foreign tourists are from the United Kingdom, followed by the United States, Canada, France and Sri Lanka.